This page is about the Mother of St John the Baptist. For a list of saints named Elizabeth, see the disambiguation page. 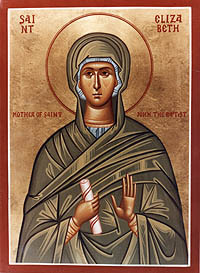 The Orthodox Church remembers the Righteous Elizabeth, the mother of the holy Prophet St John the Baptist, on September 5. St Elizabeth was from the lineage of Aaron and was the sister of St Anna, the mother of the Most Holy Theotokos. She and her husband Zachariah, walking in all the commandments of the Lord (Luke 1:6), suffered barrenness, which in those times was considered a punishment from God. When Elizabeth gave birth to a son, through the inspiration of the Holy Spirit she announced that his name would be John, although no one in their family had this name. They asked Zachariah, who had been rendered mute because of his disbelief when an angel (traditionally the Archangel Gabriel) informed him that his wife would soon bear a child, what the child's name was, and he wrote the name John down on a tablet. Immediately the gift of speech returned to him, and inspired by the Holy Spirit, he began to prophesy about his son as the Forerunner of the Lord. When King Herod heard from the Magi about the birth of the Messiah, he decided to kill all the infants up to two years old at Bethlehem and the surrounding area, hoping that the newborn Messiah would be among them. The king knew about John's unusual birth and wanted to kill him, fearing that John was the foretold King of the Jews. But Elizabeth hid herself and the infant in the hills. The murderers searched everywhere for John. Elizabeth, when she saw her pursuers, began to implore God for their safety, and immediately the hill opened up and concealed her and the infant from their pursuers. In these tragic days St Zachariah was taking his turn at the services in the Temple. Soldiers sent by Herod tried in vain to learn from Zachariah the whereabouts of his son. Then, by command of Herod, they murdered this holy prophet Zachariah, having stabbed him between the temple and the altar (Matthew 23: 35). Elizabeth died forty days after her husband, and St John, preserved by the Lord, dwelt in the wilderness until the day of his appearance to the nation of Israel. On the Greek calendar, Sts Zachariah and Elizabeth are also commemorated on June 24, the Feast of the Nativity of St John the Baptist. We celebrate today, O Lord. O Christ God, save our souls! You reflected the glory of the Messiah, the Light of wisdom! With Zachariah you walked in all of the Lord¹s commandments, Elizabeth, beloved by God. We praise the Lord, the bountiful Light, who enlightens all. This page was last edited on January 4, 2015, at 12:04. This page has been accessed 24,850 times.